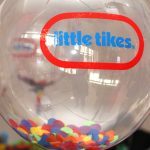 It was fun catching up with the Little Tikes and Azaria PR team to check out the new Little Tikes Baby range. On my way into London town on Wednesday, I gave up my seat for a lady as she was expecting. I started chatting to the couple who were going to become parents for the first time. They were so inspiring. They had a really fresh outlook as parents-to-be. We talked about the pressure to read lots of parenting -baby books. We agreed it was just about finding your own groove and getting to know your baby. I’m so excited about their new journey. They have lots to look forward to, especially when it comes to watching their little ones grow and develop through everyday play time. Mummy and daughter one-to-one dates are so important. 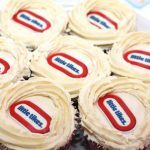 I was Baby Munch’s plus one at the launch party for Myleene Klass’ My K kids range organised by Mothers Meetings and Mothercare. We actually arrived on time at the Town Hall Hotel in Bethnal Green – an achievement for any mama and babba. Cherry Healey was leading the talk with Myleene so I knew they’d be guaranteed giggles. Jenny at Mothers Meetings along with her organised crew arranged a great afternoon. Older kids hung out at the craft table, mamas had fun browsing the new My K range and toddlers mooched around the party floor trying to reach the biggest balloons they’d ever seen. Hey there, here’s part 3 of our IVF journey. Hopefully you’ve had a chance to look at part 1 (I’d like to be a mummy) and part 2 (operation time). No worries if you haven’t, as part 3 is a story of its own. Mr.H is a pro when it comes to research. Whether it’s the latest baby gadget or the best places to travel with your kids. So I didn’t have to get stuck into too much research when it came to choosing clinics. I also didn’t have the emotional energy for it.We decided to work with the London clinic CRGH for our IVF journey. The Centre for Reproductive Health is linked to UCL Hospital where I had my bigger than expected operation. When Mr.H helped me to register my blog domain last Autumn he mentioned that “people are going to want to hear about what you’ve gone through”. I felt apprehensive about writing about our IVF journey. It still felt like a personal and precious experience. At the time we went through our fertility/infertility stuff, I was super-private about our situation. Nowadays, I’m super-open about it all. I guess I want to talk about how we found IVF in the hope it helps others who are thinking about it, trying it for the first time, who feel curious about it or who have close ones going through IVF. I now understand that sharing your experiences in real-time with people who know you well and those who don’t, opens up a world of support you may not expect. If you need to wait longer to share stuff, that’s ok too. How did Niddle Noddle come about? Katrine is originally from Denmark and has worked in various careers including photography and I worked as a professional actress for 20 years. We met in a local park by chance when our daughters were young. My husband is Danish and Katrine overheard him speaking to my daughter in Danish and we soon got chatting. We were both looking for a more stable career, something that could easily combine work and motherhood. What do you love about running the Niddle Noddle store? We’re both interested in kids design and quite soon after meeting we started discussing the possibility of setting up an online kids boutique. We also started selling at fairs and markets and began to build up a loyal following. What’s your advice for other peeps who want to set up their own business? Any challenges you managed to juggle ok? I think that because there were 2 of us, it was easier. We were able to support and encourage each other. We also did some pop up shops to test the market before taking the plunge and opening a permanent shop. It’s a huge commitment and a gamble, so you have to be pretty confident you can offer your customers something they want.We go to trade shows all over Europe to source exciting fresh talent and tend to go for smaller labels which are harder to find in the UK (sometimes only in our shop) and not too expensive. 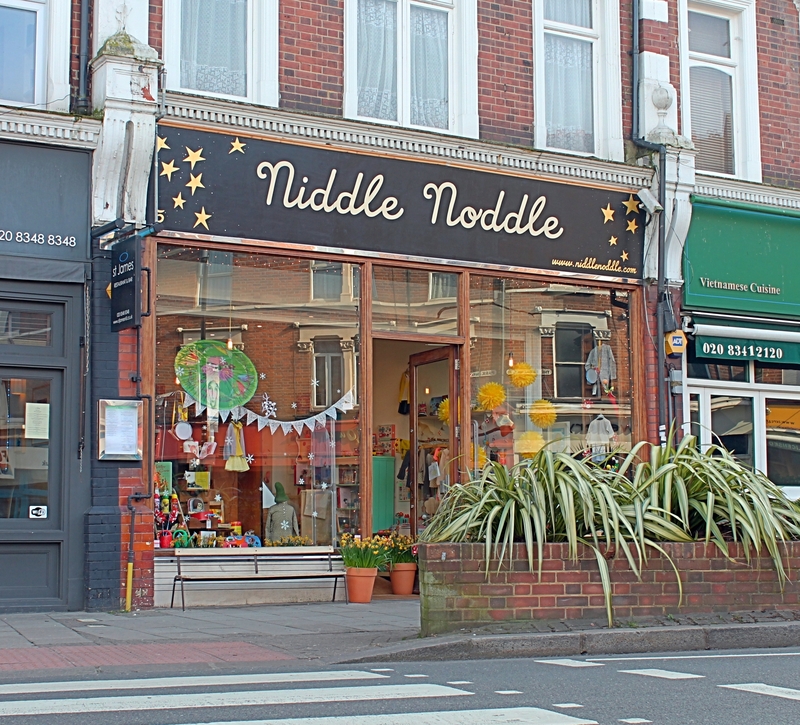 What do you think people love about coming to the Niddle Noddle store? Lots of our customers comment on the feeling of nostalgia they get when they come into our shop, seeing lots of things from their childhood, that’s really nice. We try to keep the stock fresh and are always bringing in new finds! 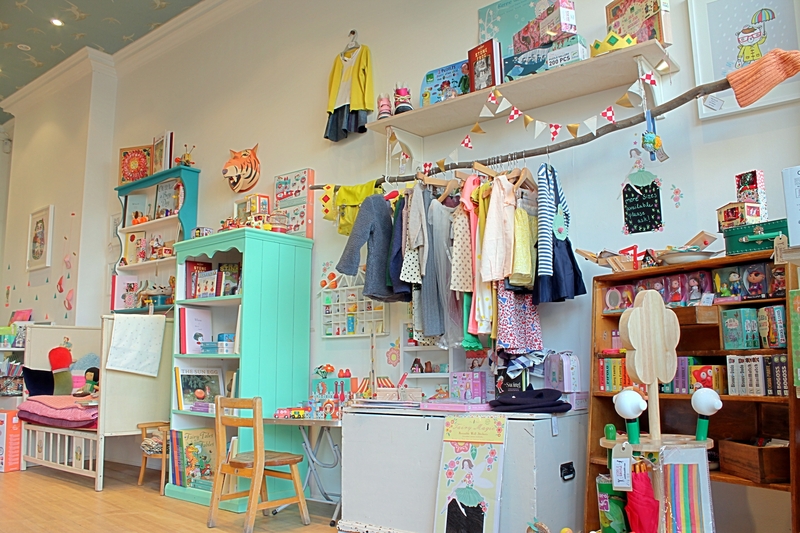 The shop has a easy feel and we try to keep it relaxed so that our customers come back! Children are encouraged to pick up toys and have a go. And of course there is the slide! 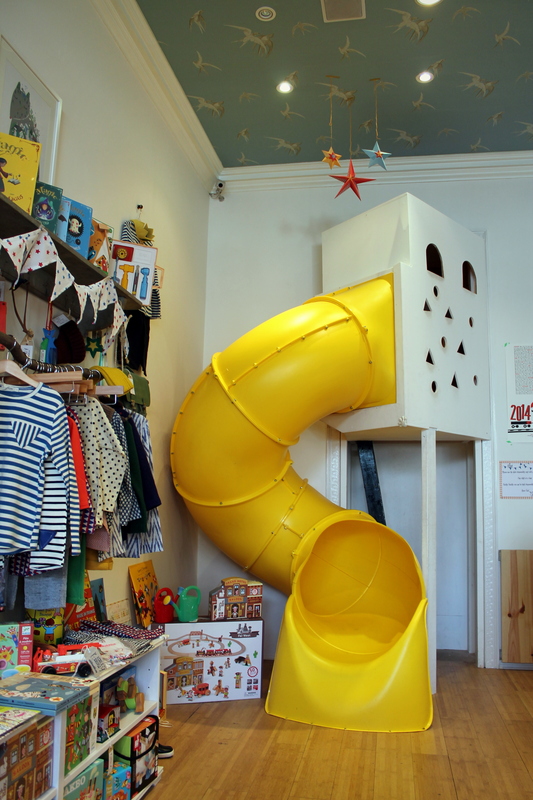 So the kids can have fun on the slide while the adults shop! We also stock lots of one off pieces (from all over the world), hand made toys and knitwear. We do stock some of the bigger toy brands such as Djeco, Janod and Vilac because we like them but most of the things we stock are unique to our shop.We have a big range of pocket money toys which have a traditional/retro feel as well as some actual vintage toys. What are your top tips for juggling a busy family life and a business? It’s always tricky finding the right balance between family and work! In the beginning, it was just the two of us and we pretty much both had to be at the shop all time. That was really tough on us and our families but we now have some lovely staff working for us which means we’re not having to be in the shop every day. We’ve taken our kids with us to Europe to see where we source some of our stock and they were very excited to be involved. Sometimes they spend time in the shop (their choice), I think it’s fun for them and they like helping out. And of course the slide is a huge draw.We try as much as possible to be able to collect our kids from school most days. It was one of the reasons we set up the business together, to enable us to be able to combine work and family life to suit us. Of course, it does help that there are two of us to share the load. What’s your top tip for parents and carers? I don’t really have a top tip as far as parenting goes, it’s important to have fun but also to say ‘no’ sometimes. What are some of your own favourite songs you enjoy playing to your children? As far as what my daughter is listening to at the moment, quite a wide range of music, contemporary and classic – a healthy mix I think. She does keep asking to listen to Nightcall by Kavinsky over and over whenever we are in the car! What are 3 of your lucky things? We’d probably say that our families and friends make us feel happy and lucky. And because we have such lovely customers, it’s a pleasure coming to work so that makes us pretty lucky! 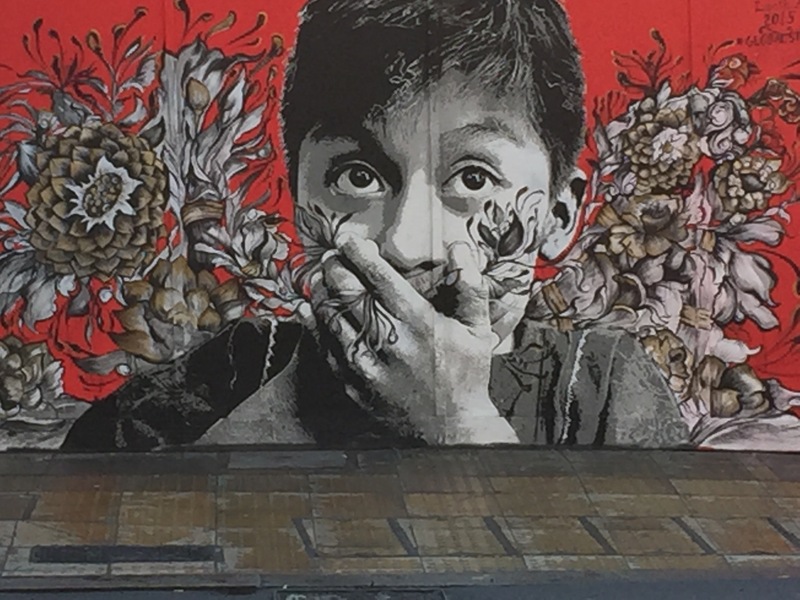 Photos by Stuart Edmondstone and published with permission from Niddle Noddle.